CMS wants more physicians to participate in ACOs and other alternative payment models (APMs). It’s best if they are risk-taking ACOs, but any ACO seems to be better than none. At least, that is what the incentives in MACRA seem to indicate. Prior to the passage of MACRA (the Medicare Access and CHIP Reauthorization Act of 2015), a physician’s only incentive to participate in a risk-bearing ACO was the perception that they would come out ahead financially. With MACRA introducing the MIPS (Merit-Based Incentive Payment System) and Advanced APM (Alternative Payment Model) payment tracks, physicians will be considering new incentives. MIPS is a zero-sum game; physicians will be rated on quality and related performance, and paid based on how they score relative to each other (eventually up to plus or minus nine percent of the Medicare fee scale). In contrast, physicians who qualify for payment under the Advanced APM track, (with a target percentage of their patients in programs subject to downside risk), will receive a guaranteed annual lump sum bonus payment totaling 5% of Medicare Part B covered professional services for each year from 2019-2024. Given the potential for receiving reduced fees, it’s understandable that physicians might be attracted to a program that offers a 5% bonus and doesn’t grade on a curve. Only 10% of Medicare ACOs currently qualify as an Advanced APM. MSSP Track 1 ACOs (the most popular) and Pioneer ACOs do not bear enough financial risk under the CMS proposed definition. There has been criticism over the small number of APMs that qualify as Advanced APMs, and CMS has been adapting some of its programs (e.g., Comprehensive Care for Joint Replacement) to meet the Advanced APM standards, and designing other new APMs (e.g., Episode Payment Models – Hip/Femur, CABG, AMI) to meet the standards. The new Comprehensive Primary Care Plus model also qualifies; practices in this model receive care management fees, performance-based incentive payments, and adjusted payments under the Medicare Physician Fee Schedule in certain regions where commercial payers have agreed to align with Medicare. Even though more programs are qualifying as Advanced APMs, it may be difficult for physicians to maintain APM status once achieved. Primary care physicians will find it easier to qualify than specialists, who would need most of their referring physicians to participate in Advanced APMs in order to qualify. 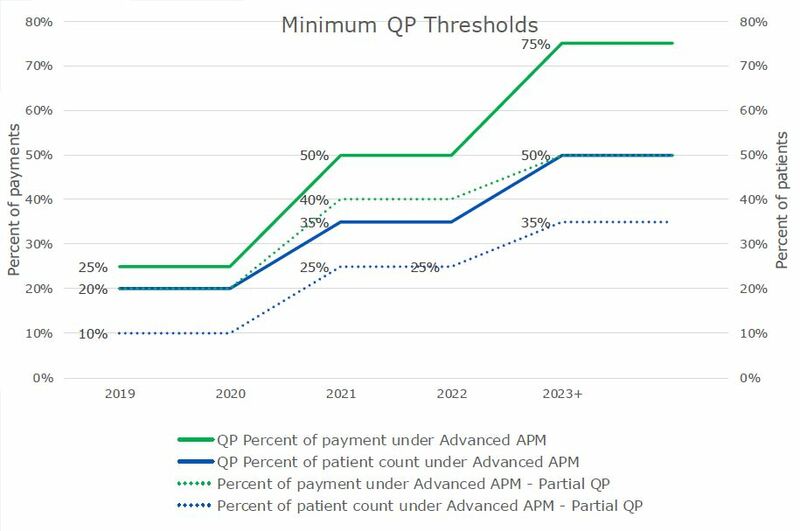 As shown below, CMS increases the thresholds that must be met to be a qualifying provider (QP) over time, meaning a physician can invest in the Advanced APM model, qualify in 2019 and 2020, and but fail to qualify in 2021 and beyond as thresholds become more difficult to meet. Possibly to offset these complications, and to further incentivize participation in alternative payment models, CMS is offering other benefits, even if an APM or physician does not fully qualify. Partial QPs and participants in what CMS calls a “MIPS APM” (which includes most non-Advanced APMs) receive MIPS composite scores equal to the average for the entire APM or Advanced APM in which they are participating. This significantly reduces the probability of large swings in rate adjustments. Additionally, MIPS APMs receive some relief from reporting requirements and benefit from preferential scoring. For example, MIPS APM clinicians are not assessed on Resource Use, and will automatically receive at minimum one-half of the total potential points related to Clinical Performance Improvement Activities. A partial QP has the option to avoid MIPS payment adjustments altogether. All of these are part of the proposed rule, not the final rule, so changes are possible, particularly at this level of detail. Physicians will be assessing their options for either avoiding MIPS or at least performing well under it. Many will be looking for Advanced APMs for the 5% bonus and to avoid MIPS. However, even non-risk bearing ACOs will help physicians improve their MIPS scores and position them for an Advanced APM in the future. By applying these incentives, CMS is increasing the attractiveness of ACOs and other APMs, and giving them new tools to compete for physician loyalty.